Freezer Meals | I, Sarah, Take you. Along with 1000 other ‘baby prep’ things that are going on in our household, one of the big ones on the list were some easy freezer meals so we are able to eat healthy and give the much needed time and attention to our new addition. -Research: This included recipe ideas, the best way to freeze meals, the best way to do food prep, etc. Do you even call that a recipe? 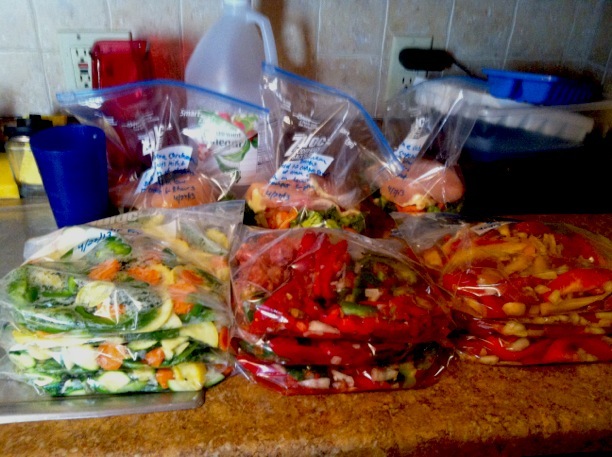 I just chopped up veggies, blanched them and put them in freezer bags. I’m not sure when I learned about the whole blanching thing but from previously freezing vegetables I remember this as being a pretty important part as it helps preserve the taste and color of your veggies. Blanching times can vary from 1-10 minutes depending on the type of vegetable. I recommend looking up the veggies you are looking to blanch. The vegetables I chose were carrots, yellow squash, zuchini, snap peas, green peppers and broccoli. Approx amounts: 4 large carrots, 2 yellow squash, 2 zuchini, 1 small bag of snap peas, 2 green peppers and 2 crowns of broccoli. This made 4 bags of 2 servings each. This recipe is a variation of a few different recipe’s I found, plus things I thought that should be added. 2 red peppers, 2 green peppers, 2 cans of diced tomatoes, 1 diced onion, 1 clove of minced garlic, italian seasoning and 5 sausages. This is a crock pot recipe to be cooked on low for 6-8 hours. Another crock pot recipe, this is beef tips, red-yellow- and orange peppers, onions and a sauce made of olive oil and lime. Pretty simple! This recipe calls for chicken breasts, broccoli, carrots, onion and salt/ pepper. That’s it! Another awesome crock pot recipe and just put a can of cream of chicken soup and a cup of milk when you cook! Some people are hesitant to freeze everything together. I’ve done this many times before and had no issues. If you want your meat and veggies kept separately you can always put the meat in a different bag and put inside the big bag of vegetables. This isn’t me advising you either way so I encourage you to do research and make a sound decision based on what is important for you. We ended up with 14 bags-2 servings each which technically leaves us with 28 meals. We will be making more freezer meals soon! Stay tuned! !